March 22, 2012. 80-minute talk from New Hamlet in Plum Village, France. The talk is given in English. 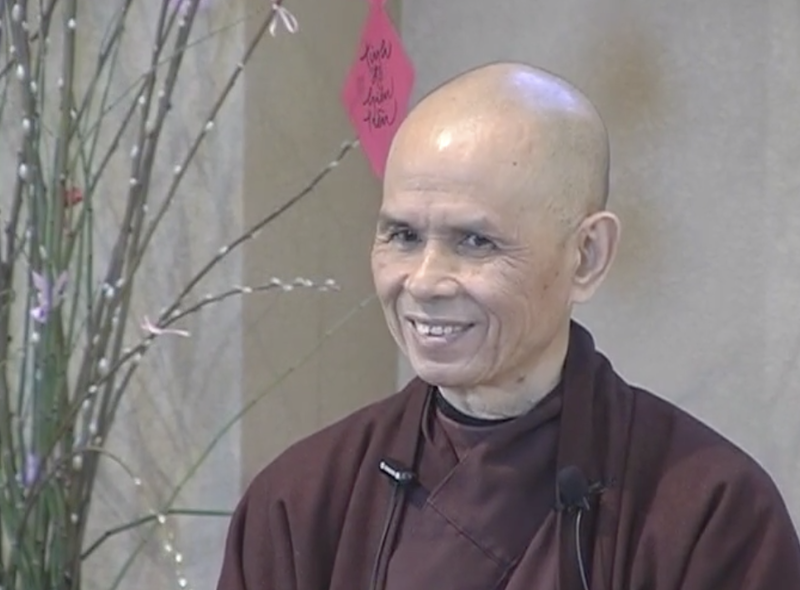 We begin with 4-minutes of chanting in Vietnamese. In Plum Village, our practice is to always go back to the present moment. We do this in many ways, like mindful breathing and mindful walking. Simple, but very important practices. We have the Sutra on the Full Awareness of Breathing is one of the most important sutras. In this talk we review the first six exercises. When going through a difficult situation can be supported with these practices. It can be your second body. That is the Buddha. Thay briefly discusses the Abidhamma literature – super dharma. Stick to the sutras and what they stay and don’t venture into metaphysical speculation. Though past, present, and future look different, they are actually the same. They are ideas. Notions. This is Interbeing. Nothing is born. From nothing you cannot create something. This removes the notion of creation. This is something stated by science. This is the product of the intellect and is equivant to our idea of no birth and no death. Nothing has a separate existence. “Breathing In” is not just for beginners. It is the most wonderful thing to do.